This News Roundup will cover some new news and some of the older news that I could not fit into the last Roundup. And here is the news. Let’s start this News Roundup with news from Starkville, an area that is largely ignored by Preservation in Mississippi because the area usually ignores its architectural heritage. However, Starkville has had a change of heart recently with the election of new city officials. So Tuesday, August 24, 2010 is not a date that will live in infamy, quite the opposite as the Starkville Historic Preservation Commission, a newly formed group, met for the first time. This excerpt from The Starkville Dispatch’s August 25 edition (“Group to examine possible historic districts”) should give the details of the newly formed group. The eight-member commission was created to advise the Board of Aldermen on matters related to historic preservation in the city, including the designation of historic districts, landmarks and landmark sites. The Board of Aldermen ultimately could pass ordinances which designate older portions of the city as historic districts and landmarks based upon the Historic Preservation Commission’s recommendations. The commission will review permit applications for alterations, construction, demolition, relocation and subdivision of structures in the newly formed historic districts. 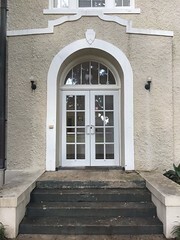 For residents who live in city-designated historic districts, no exterior feature of any home or other resource shall be altered, relocated or demolished until after an application for a certificate of appropriateness for such work has been approved by the Historic Preservation Commission. However, the Historic Preservation Commission only will serve in an advisory capacity to the Board of Aldermen and aldermen will have to approve certificates of appropriateness before the city issues building permits. To receive a certificate of appropriateness, all exterior alterations to a building, structure, object, site, or landscape feature must be compatible with the resource itself and other resources with which it is located, including architectural design, materials, size, color, trim and other features, according to the ordinance. To receive a certificate of appropriateness for construction projects in Starkville’s historic districts, new structures also must be visually compatible with the surrounding environment, including height, gross volume, materials, textures, colors, patterns and roof design, among other features. Michael Fazio is the chairman of the Historic Preservation Commission. Fazio is the former Dean of the Mississippi State University School of Architecture and author of several books, the most notable being The Domestic Architecture of Benjamin Henry Latrobe, which one can read or use as a spare table (it’s a really big book). The next meeting of the Historic Preservation Commission is September 28 at City Hall. Also from The Starkville Dispatch (which is really just The Columbus Dispatch) is a small article on the Columbus Opera House. Like The Oxford Eagle, the Columbus paper also has a weekly local history column. Local Columbus historian Rufus Ward is the author of this “Ask Rufus” column. Not all the columns focus on architecture but the August 22 column on the demolished Columbus Opera House is one that does. The Reflector, Mississippi State’s student newspaper, reported in its first paper of the new school year about the construction activity around the campus. The article “Not so ‘Suttle’ ending” mainly discusses the demolition of Suttle Hall, which has been discussed on Preservation in Mississippi before. However, the article raises the specter of demolition for Rice Hall, which is only a year younger than Suttle. I actually like Rice Hall, especially the balcony arrangement on the front façade and its demolition would be far more grievous than Suttle’s. The article also mentions the ongoing renovations to Lloyd-Ricks Hall, Harned Hall, and Middleton Hall, all historic buildings. Finally, the article states that the construction of a parking garage behind the YMCA Building has been approved. Belinda Stewart Architects was awarded the contract to design the parking garage. While it will be interesting to see the design, I already know that I will hate it simply for its existence. The hill behind the YMCA Building is such a spectacular hill with the historic buildings along its crest, and it is a shame those who created and implemented the MSU Campus Master Plan cannot see that. from the Federal Aid Highway Program. was engineered by Eli Abbott Jr. The Bolivar Commercial reported on August 15 that the Dockery Service Station has been restored. 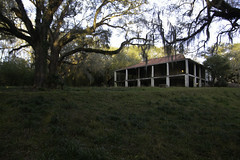 The Dockery Farms Foundation website has a picture of the pre-restoration Service Station. The Vicksburg Post ran a story with photographs on August 8 about the demolition of the historic Washington Street Bridge. The bridge is an 80-year-old overpass across the Kansas City Southern Railroad tracks. After a year and a half of being closed to traffic, the bridge is coming down, with the last beam taken down on August 18. It will still take twelve months to replace the bridge and reopen that major thoroughfare to traffic. The Washington Street Bridge’s demolition is unfortunate simply because all new bridges today seem to only be pre-cast concrete sections with no decoration and solid barriers, not decorative railings. Now into the older news. I am really getting into the local history columns from various papers. Last week I wrote about Jack Lamar Mayfield’s “A Sense of Place” column in The Oxford Eagle. This week I have already written about Rufus Ward’s “Ask Rufus” column in The Columbus Dispatch. Now, from The Mississippi Press, is Joanne Anderson’s “Sampling Our History” column. Like the other two columns, “Sampling Our History” is not strictly about architecture or historic buildings. The July 11 column “Singing River Indians 1939 mural returns to post office” details the Lorin Thompson mural, The Legend of the Singing River, which was originally in the old Pascagoula Post Office. The old Pascagoula Post Office became the Pascagoula Public Library in the 1960s at which point the mural was moved to the new post office. The old post office on Delmas Ave. was demolished in the 1980s while the new post office on Jackson Ave. was destroyed by Hurricane Katrina in 2005. The mural survived and was placed temporarily in the Moss Point Post Office, “rolled up and propped up against a wall.” Now the mural has a place of honor in its third Pascagoula Post Office. The mural is also discussed in Karal Ann Marling’s Wall-to-Wall America: Post Office Murals in the Great Depression. Malvaney discussed the lack of Monroe County news in the July 23 News Roundup. This post should rectify that situation with a Monroe County news explosion. The first article of news is from back on June 9. The article “Chugging along: Old railroad depot gets a facelift” discusses renovation efforts at the Mobile & Ohio Depot in Aberdeen. The Mobile & Ohio Railroad Depot is the oldest railroad depot in Mississippi with a probable construction date of either 1857 or 1869, possibly making it the only antebellum railroad depot in Mississippi and one of the few in the South. The Mississippi Heritage Trust placed the depot on their 10 Most Endangered Historic Places in 2007. The article contains a great history of the building, an amazing survivor as it has not been used as a depot since 1948 and was severely weakened structurally by renovations in the 1970s. 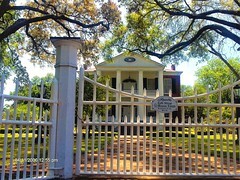 The city, which owns the depot, wanted to demolish it for about thirty years but was prevented by the structure’s status as a Mississippi Landmark. Save Aberdeen Landmarks, which has in recent years become very active, maintains a webpage on the depot. Another article from June 16 “Public files into M&O depot’s open house for glimpse at progress” details more restoration plans from Save Aberdeen Landmarks. The July 28 edition of The Monroe Journal reported that the old Amory National Guard Armory will receive a new $174,900 roof. This armory, designed in 1939 (or 1937 in other sources) by N. W. Overstreet and A. Hays Town, was the recipient of a MDAH Community Heritage Preservation Grant last December, as Malvaney reported back then. The City of Amory received $132,775 for roof replacement. 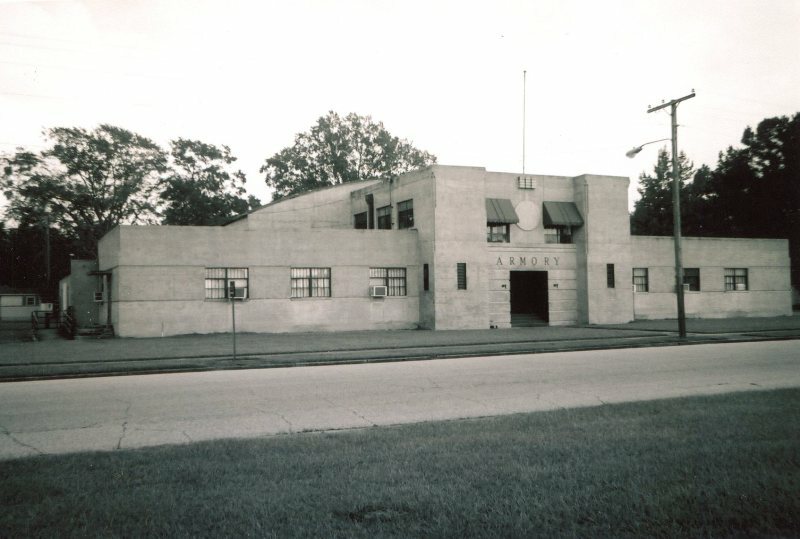 The armory, located on 9th Street in Amory, is a great example of WPA architecture and was constructed in conjunction with armories in Aberdeen, Meadville, and Starkville (the present city hall). 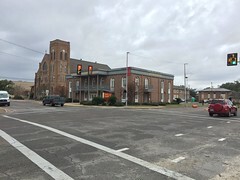 The Starkville and Amory buildings are nearly identical, the Starkville Armory only lacking the front one story wings of the Amory building due to site constraints. Accurate Roofing of Potts Camp will replace the Amory Armory roof. More details about the armory are found in the articles “Amory awarded grant to re-roof armory” and “Amory to seek grants to upgrade old armory” from many months ago. No, I am not done with Monroe County preservation news. I am not even finished with Monroe County historic churches. Two articles from The Monroe Journal present efforts by a group of Amory citizens, The Windows Initiative, to save the First Christian Church. The first article, “Looking for salvation” from July 28, discusses the history of the First Christian Church. This church has been a fixture on Third Street in Amory since 1926. 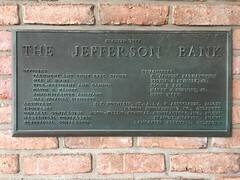 It remained as First Christian Church’s sanctuary until 1988, when the congregation sold the building to Freewill Baptist Church. Freewill Baptist later moved and placed the building for sale last year. The church is in remarkably good, original condition with the original stained glass windows, original curved pews, original pressed tin ceiling, and ceiling fans (which have long disappeared from historic buildings in favor of HVAC systems). The second article, “Group needs funds to buy historic church” from August 4, discusses the group’s plan to transform it into an arts center. The Windows Initiative wants to create a place for local artists to gather and display their artwork, something Amory currently lacks. As the article’s title suggests, the group needs a considerable amount of money to make that a reality. The church was originally listed last year at $175,000 but has dropped to $77,200, making the large site a tempting target for buyers with an interest only in the church’s lot. With the purchase price, closing costs, and repair costs, the Windows Initiative needs to raise an initial $85,000, a large amount for a small group in this economy. I certainly hope that any group as creatively named as the Windows Initiative, which sounds like some New World Order type group (like the Bilderberg Group), can raise the money to save the First Christian Church. Several pieces of news come from the Copiah County Courier. This first and most recent is about the destruction of the Rainbow Barn in rural Copiah County. This barn has been a landmark along I-55 for over three decades. The August 24 story “Copiah’s Americana icon falls victim to storm” contains the unfortunate details of the old barn’s destruction. The second story, “Preserving downtown” from July 14, states that the Hazlehurst Chamber of Commerce is attempting to create a local preservation ordinance for Hazlehurst, which contains 377 buildings on 150 acres in its historic district. The Chamber of Commerce also wants Hazlehurst to become a Certified Local Government, so that grant money can be used to improve the downtown historic district. The third and final article from the Courier, “Georgetown church seeks nomination for historic register” from back on June 30, discusses Georgetown Methodist Church, a rural craftsman-style structure dating to 1936. 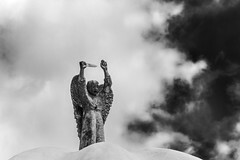 The church is currently maintained by the Board of Trustees, primarily composed of the family and friends of Carolyn Beasley, a church member since the 1970’s. The church needs some repairs and the small congregation is worried about the future of the building. Ms. Beasley is hoping that National Register status will solidify its historical significance in the eyes of the community and bring those who care about it together so that it can be saved for future generations. Historic rural churches, like rural schools, are a dwindling resource in Mississippi, with many suffering from the same problems as Georgetown Methodist: a small congregation, a lack of funds, and a deteriorating building. The Georgetown Methodist congregation, unlike some other congregations, is interested in preserving their historic church building. Judging by the photograph, I would hope their National Register nomination is a slam dunk. I also read an article recently about how many MSU students got turned away from on-campus housing almost at the last minute before the start of the semester due to lack of space. The Clarion-Ledger article said that this was “in spite of the opening of a new residence hall” but it failed to mention that it was in the midst of the demolition of a much larger dormitory. When will the journalists start asking questions about this kind of stuff? I’m so very sad to hear about the destruction of the rainbow barn, always a fun cheerful site on the trip up I-55 and of course a great example of Mississippi/Southern vernacular architecture. Re: James Creek, I wonder if the building has had two different congregations–one Methodist, the second Missionary Baptist? Let’s all say “Amory Armory” ten times fast! What a beautiful armory…what does the interior look like…??? It looks small…is there a balcony for the fans to watch events or any kind of ceremonies ? Thanks for posting this awesome building…Three cheers…Hip Hip…!